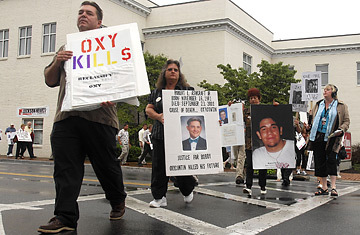 A crowd of people march to raise awareness about the abuse of Oxycontin in Abingdon, Va., where three current and former executives of the drug's maker were to be sentenced for misleading the public about its risk of addiction. Three of pharmaceutical giant Purdue Pharma's top current and former executives skirted a prison sentence in federal court today, winding up instead with three years probation and 400 hours of community service to serve instead. Federal Judge James P. Jones ordered the maker of the prescription painkiller OxyContin and the three executives to pay a $634.5 million fine for misleading doctors about the narcotic's risk of addiction. The company had touted the drug as less addictive than more traditional narcotics, despite the fact that the pill can easily be crushed and converted into a powerful street drug. Michael Friedman, who retired last month as the Connecticut-based company's president, lawyer Howard Udell and former chief medical officer Dr. Paul Goldenheim had pleaded guilty in May, in return for accepting the fine. The surprise from today's ruling was the inclusion of the community service penalty  each man will have to serve his 400 hours working in drug abuse prevention or treatment, which would amount two and a half months of 40-hour work weeks spent fulfilling the sentence. But the big question inside and outside the courthouse today was, does the punishment fit the crime? It's an explosive issue here in the southwest Virginia, which like much of Appalachia, had long suffered from a wave of addiction to the drug. More than 100 people gathered at a morning rally in a town park to tell their stories about the prescription drug before moving to the courthouse. In the afternoon, many of them would be in the courtroom, giving victim statements in front of the pharmaceutical executives and the judge. One woman carried her son's urn. "You are responsible for killing my son," she told the three men. "I think jail is too good for you and I think you need to spend some time in a rehab facility, like my son, and maybe you will change your mind. My son's prepaid college ended up paying for his funeral." Those individual costs mounted for communities throughout Appalachia. Federal authorities in Virginia began investigating Purdue about five years ago when crime, addiction and death rates skyrocketed in the mountainous part of the state. "This is a fine of insignificance when we look at the consequences that this drug has had not only in this area but around the country," said Sister Beth Davies, director of the Addiction Education Center in neighboring Lee County. "No one is being held accountable. The penalty in no way fits the crime." Davies said she first took notice of the drug in 1999. By 2001, she said there was such rampant drug abuse that her group, Lee County Coalition for Health, met with Purdue Pharma and asked the company to recall and reformat the drug. She said the company particularly targeted southwestern Virginia because of its high Medicaid and disability rates. A lot of coal miners suffered from pain, for example, and they were among the prime targets of Purdue's risky marketing. "This has changed the face of Appalachia," Davies said. "The foster care rate, the crime rate, we never had any of this until OxyContin came in." Purdue, which was represented earlier on in its negotiations with the government by Rudy Giuliani, did admit to mislabeling the drug from 1996-2001. But how much responsibility does a drug company bear for the bad decisions that individuals make, particularly after the criminal crackdown on OxyContin abuse began? In the end, questions like that may have kept the executives out of prison. As for the monetary fine, $634.5 million is a record sum, but considering that OxyContin continues to be wildly profitable (though more carefully advertised and regulated), it won't be a crippling blow to Purdue. The company has, after all, earned over $2.8 billion from OxyContin since the drug was first introduced, including $595 million in OxyContin earnings in 2006 alone. But in Abingdon today, it is clear that this fight has become personal  in part, it's a story of people who feel deeply wronged by powerful outsiders. Elsie Gray, who had driven two hours from her home to stand in the rain for the victims' rally, is one of the aggrieved. Her son, a former coal miner, is serving a 15-year prison sentence after being caught with two OxyContin pills and 2.4 grams of cocaine. She was angered that the fines were mostly going to state and federal Medicaid fraud or other health programs, not specifically to rehab programs. And now she feels like these executives would just go back up north with less of a sentence then they deserved. "They should do some community service in our state," she said. "They should go to a rehab here."